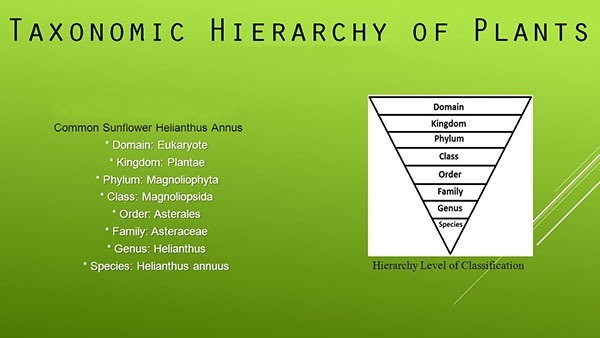 Classification, taxonomic hierarchy and nomenclature of plants are included in plant diversity. The presence of variety of plants in the form of different Taxas (specie, genera) is called diversity of plant. Different plants have different morphology, physiology, cytology and anatomy. It produces diversity among plants. The study of kinds and diversity of organisms and the evolutionary relationships among them is called systematics or taxonomy. The study of systematics gives the order and relationships among the organism. This order and relationship arise from evolutionary processes. These studies also give description of the new species. It organizes the animals into groups (taxa). This grouping is based on degree of evolutionary relatedness. The modern classification system has been given by Carolus Linnaeus. This system of classification is still used today. Carolus Linnaeus believed that different species could be grouped into same categories on the basis of similarities between them. The group of animals with similar characteristics a Taxon. For example, Amaltas (cassia fistula) shows similarities with other cassia specie (cassia senna). Both have compound leaves and produce bean. Therefore, all such plants are placed in the same taxon. Moreover, Cassia also shares characters with Bauhinia verigata (Kachnar). So, they are place in the same family. Carolus Linnaeus recognized five taxa. Modern taxonomists use eight taxa including earlier five taxa. The taxa are arranged hierarchically. It means arrangement of classification from broad to specific. These taxa are: Kingdom, Phylum, Class, Order, Family, Genus, and Species. Carolus Linnaeus did not accept evolution. But still many of his groupings show evolutionary relationships. Morphological groupings similarities between two plants have a genetic basis. It gives rise common evolutionary history. Thus, the plants are grouped according to similar characteristics. Carolus Linnaeus grouped them according to their evolutionary relationships. The members of the same taxonomic group are more closely related to each other than the members of different taxa.